Copics and added Crystal Effects to the eyes. I love the mini diamond pattern stamp - inked with Twisted Citron distress ink - that is part of a Dylusions clear stamp set by Ranger. 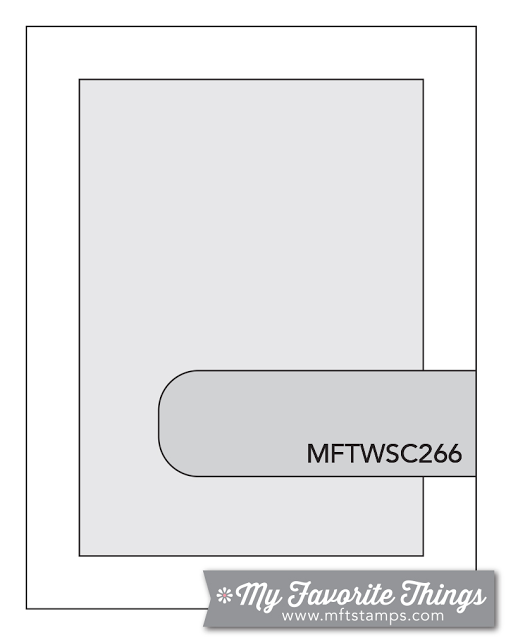 I then used some white texture paste with a border of mini dots from the Mini Halftone Borders stencil. My new fave floral dies are the Perky Posies by Lil' Inker Designs...so many possibilities to layer them up! Once I completed the tag, it looked rather lost on a white base, so I decided to use a couple of neutrals (kraft and touch of black) to make it pop better. I'm also entering this into Simon Says Stamp's Wednesday Challenge where anything goes this week! Since Ranger is sponsoring the challenge, it was perfect to enter this card since it uses a couple different Ranger products. It's been great having Leslie Miller as our guest designer this month and I hate to see her time come to an end! Thanks for all your inspiration, Leslie! Stayed tuned next week when we reveal the April guestie! Congratulations to our guest star stamper this week - Jen of The Other Fickle Pixie (AKA MAGIC FLY BOOTS)! 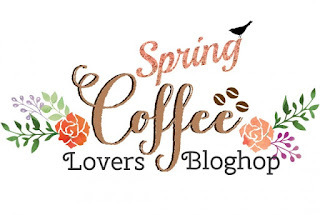 Be sure and stop by her blog to say hello! We are at the last Monday of the month, so that means a shape other than A2 is up for grabs for the Mojo Monday Challenge! Julee has a great square layout for us, so I started with a 5" square base. I was so excited to see that Target carries Neenah Bright White paper (65 lb.) 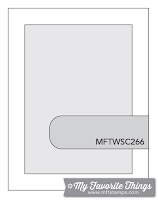 - not as heavy as the PTI white I normally use, but definitely a usable alternative. I was in the mood for a black and white with a pop of color scheme and though I initially had planned to go with red poppies, I decided to layer up these new daisy dies in PTI Harvest Gold instead! I sponged the edges with Crushed Curry (SU) ink then layered with foam tape. 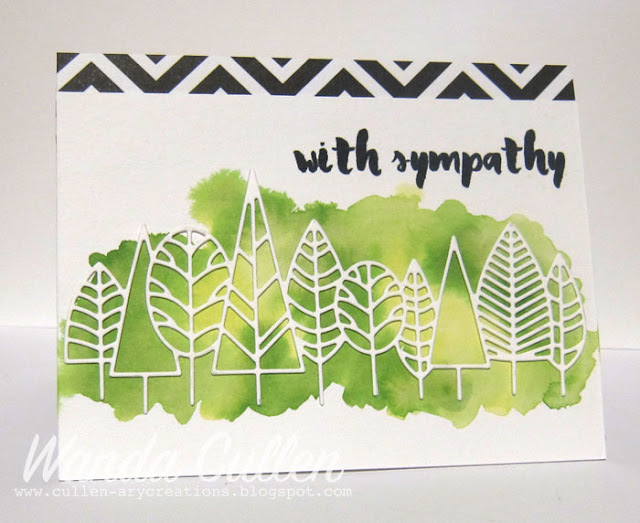 The leaves were stamped using WPlus9's Beanstalk ink - my favorite spring green shade! Once again, I used another great sentiment combination from Verve's last release. STAMPS: Bloom and Grow (leaves), Simply Amazing (sentiment) - both by Verve. PAPER: Black and White by Recollections; Harvest Gold and True Black by PTI; Neenah Bright White; Metallic Gold by SU. DIES: Elegant Leaves, Springtime Stitches, Simply Daisies, Amazing Adjectives - Verve; Stitched square, circle and rectangle dies by Lil' Inker Designs. Hope to see you in the gallery!! 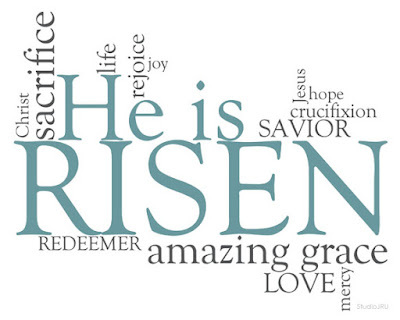 Wishing each of you a happy and blessed Easter! 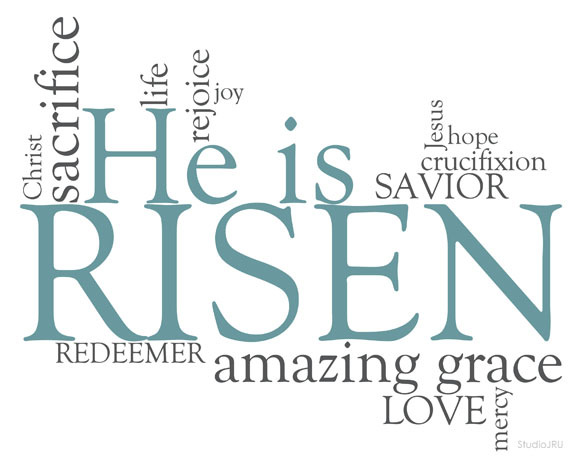 John 3:16 pretty well sums up the holiday in a nutshell. We have hope in a living Christ! 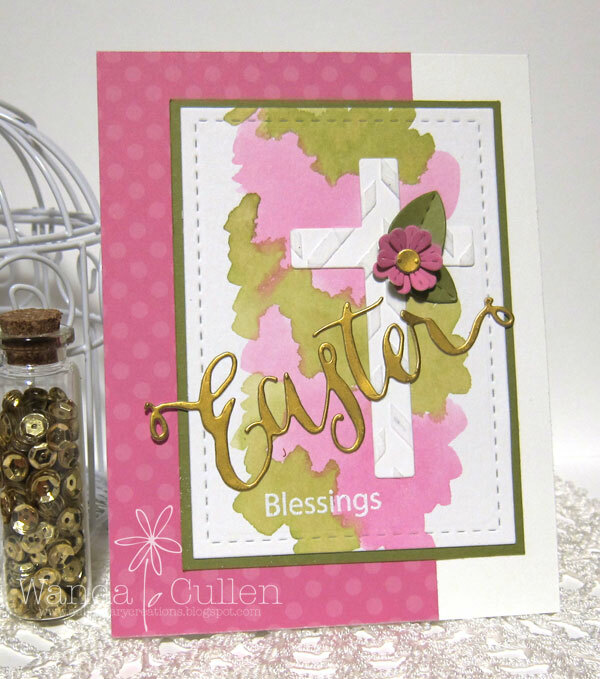 I wanted to create a quick Easter card using some elements from my leftover stash. 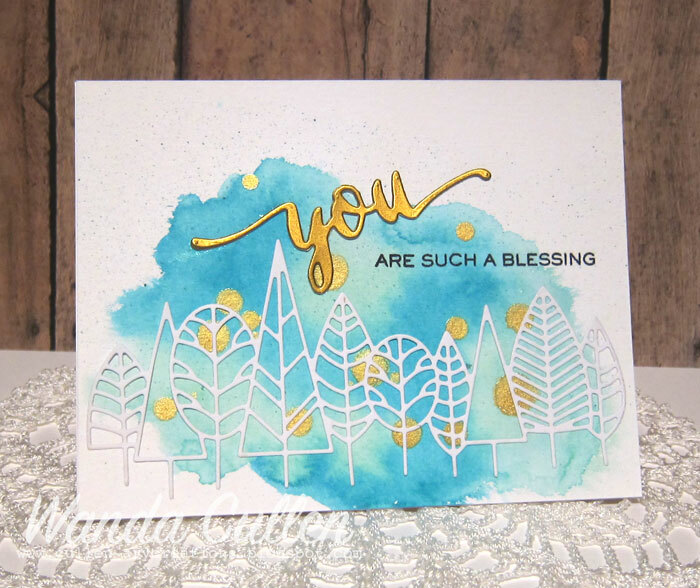 I went to the Featured Stamper Challenge on SCS and found that Jenn Shurkus is in the limelight this week and was thrilled to find so many gorgeous cards in her gallery! I was especially blown away by this gorgeous watercolored BG found on this card! 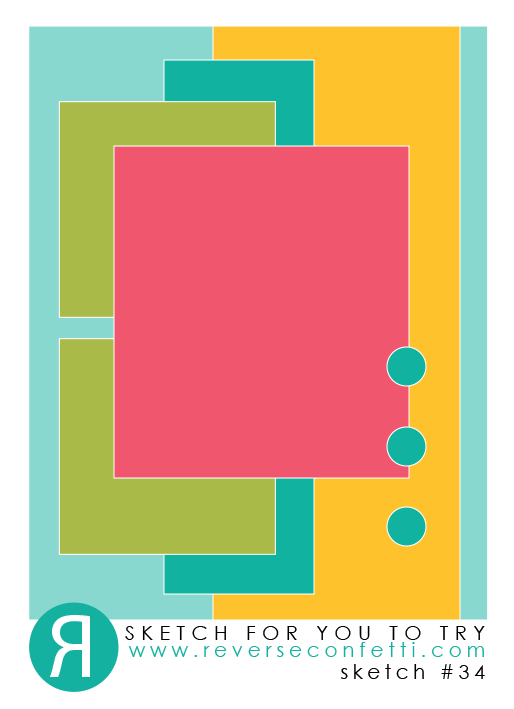 I CASEed her use of white on primarily pink and green and changed up the sentiment to gold instead of black. The cross was die cut from a leftover panel that was embossed with white texture paste using a Tweed Pattern stencil by Hero Arts. The sweet flower is a new posy die set by Lil' Inker Designs. STAMPS: Rejoice (Simon Says Stamp). 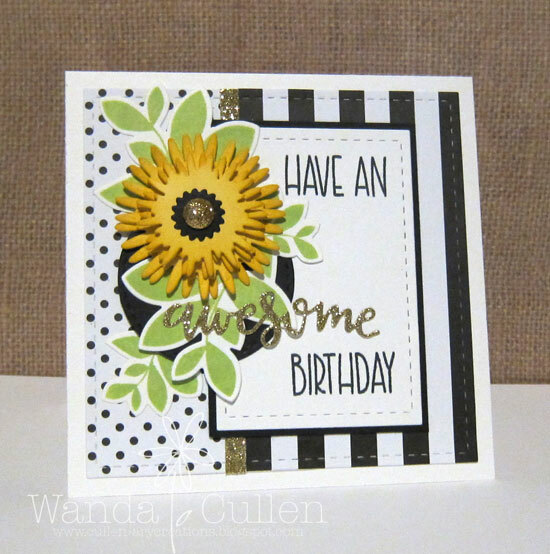 PAPER: Tim Holtz Watercolor CS, Old Olive, Hello Sunshine bye Doodlebug Design Inc., Metallic gold CS, Neenah Bright White. INK: Picked Raspberry and Crushed Olive distress inks; Versamark. DIES: Stitched rectangle and Perky Posies die sets by Lil' Inker Designs; Easter and Cross set dies by Simon Says Stamp. 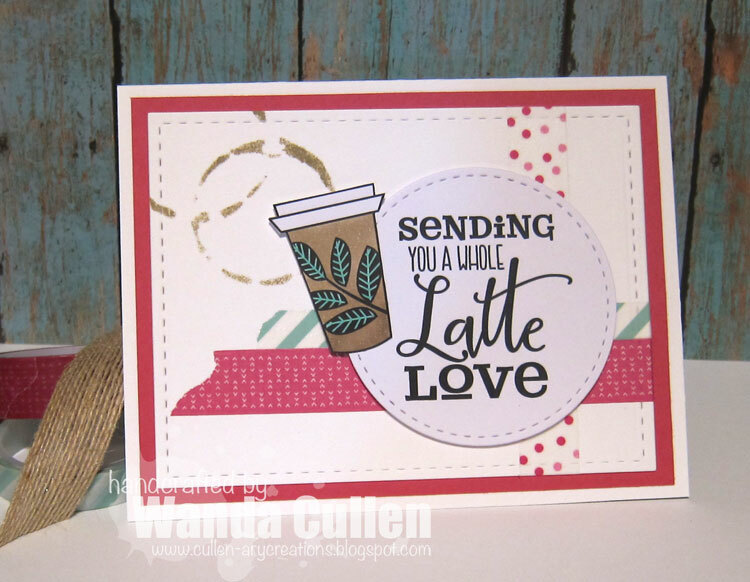 I'm getting close to the wire for Amy's Spring Coffee Lover's Blog Hop and decided to go with the colors from the current ColourQ Challenge for this quick and simple card. I had these Verve digi images printed from last year, so this fell together quickly with some washi tape and a stenciled mini coffee splotch by TCW. Hey everyone! 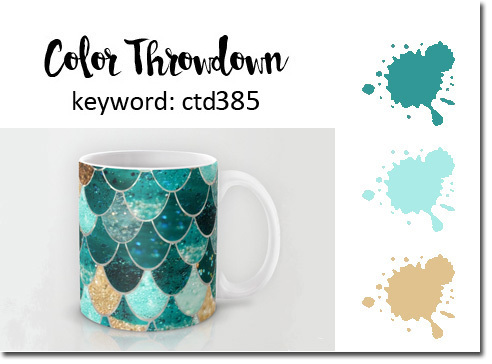 Check out these GORGEOUS colors that Jodi has chosen for the Color Throwdown Challenge this week: teal, aqua and gold!! I knew right away I wanted to watercolor a background using distress inks (Peacock Feathers, Pine Needles, Cracked Pistachio, Tumbled Glass) and then added some splatters of Heidi Swapp Gold Color Shine. I die cut 2 butterflies (Concord and 9th's Floral and Flutter Dies) - one in Tropical Teal and one in White CS. 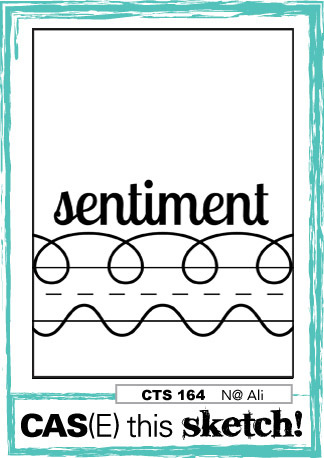 The sentiment and coordinating word die is from Verve's latest release: Amazing Adjectives die set and Simply Amazing stamp set. Congratulations to our guest star stamper this week - Betty Keefe! Be sure and stop by her blog to say hello! I'm really looking forward to seeing what everyone creates and am thrilled that so many of you are playing along with us! Happy stamping and hope to see YOU in the gallery! March is marching on and another Monday has rolled around, so that means it's Mojo Monday Challenge time! I've been a slacker when it comes to getting Easter cards made this year, so knew I needed to create something for my dad. 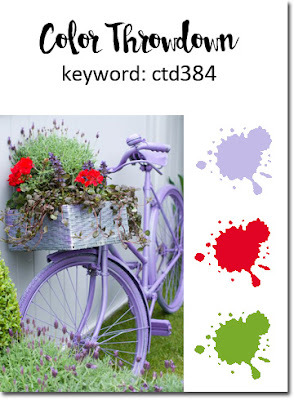 I wanted something with happy spring colors and knew it had to include a cross. Afterall, that's what the holiday is all about! This ribbon has been in my stash for a LONG time, so I basically started with that then found designer papers from Echo Park's Summer Days pad that seemed to match well. 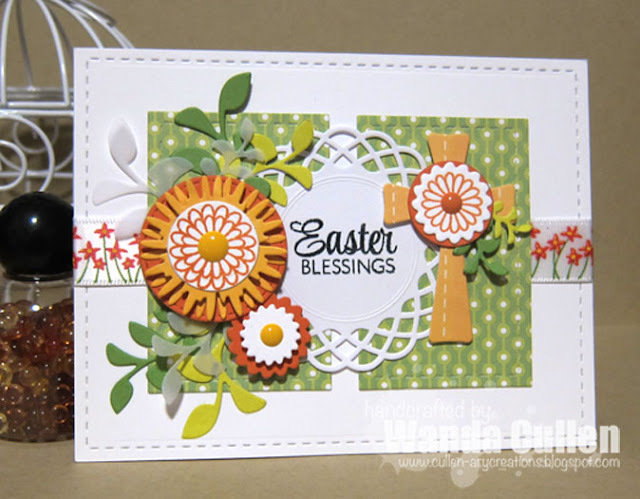 I used the New Beginnings stamp set from Verve's last release and combined old and new Verve dies: Springtime Stitches, Simply Daisies, Cross Set and Sprightly Sprigs. The sentiment was stamped in black on a Martha Stewart doily then clear embossed. Leaves were cut from vellum and from 2 different greens in my leftover pile. I couldn't pass up this great layout for the CAS(E) This Sketch Challenge! 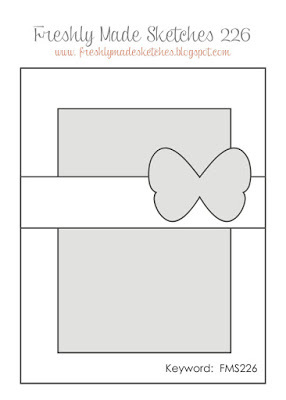 I went with a horizontal version so I could use this Boddington Tree Border die (PoppyStamps). It all started with a leftover piece of watercolored CS - Peacock Feathers and Cracked Pistachio distress inks - that I paired with this border die. 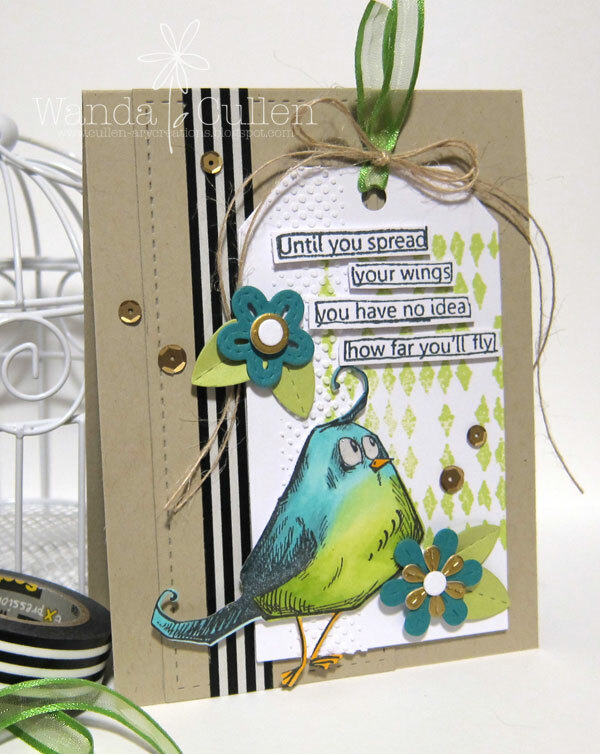 The sentiment die and stamp are from WPlus9's Hand Lettered Thanks set. I splattered some Gold Color Shine (Heidi Swapp) over the BG. Easy peasy! Headed off to watch some March Madness basketball games and maybe a bit of Nascar! Thanks for stopping by! I'm not sure that red hydrangeas even exist, but I decided to create one anyway. 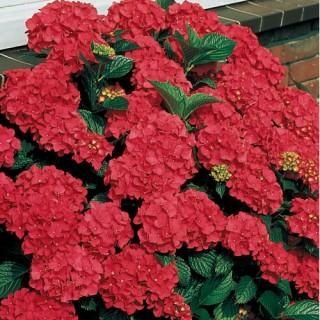 :-) Edited to add: I went to Google images to search and yes, indeed...there are all kinds of red hydrangeas! I have very little lavender paper in my stash, so went with a darker shade and cut the border and sentiment die from Elegant Eggplant CS (SU). I used Cockleshell (WPlus9) dye ink to sponge the background with MFT's Wonky Chevron stencil. The hydrangea was stamped using Impression Obsession's Hydrangea stamp set in Real Red and Garden Green inks. I used the coordinating hydrangea dies for the leaves and tiny flower petals. 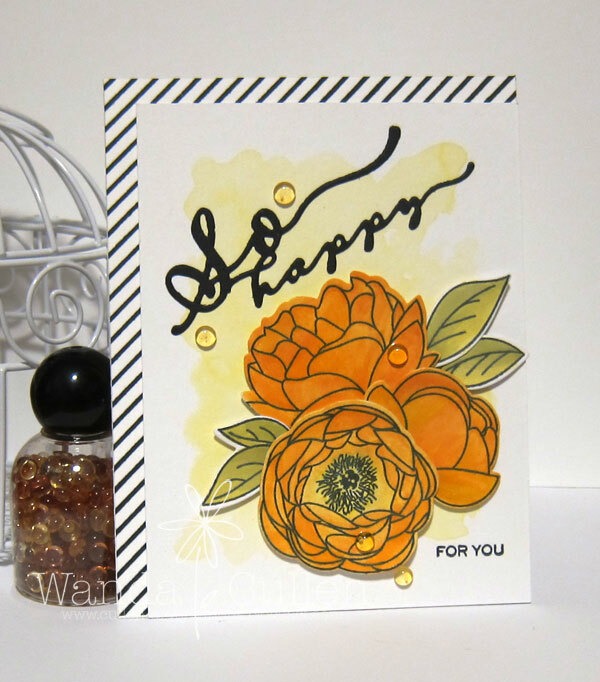 I'm really loving this sentiment die and stamp from Verve's recent release - Amazing Adjectives (dies) and Simply Amazing stamp set! 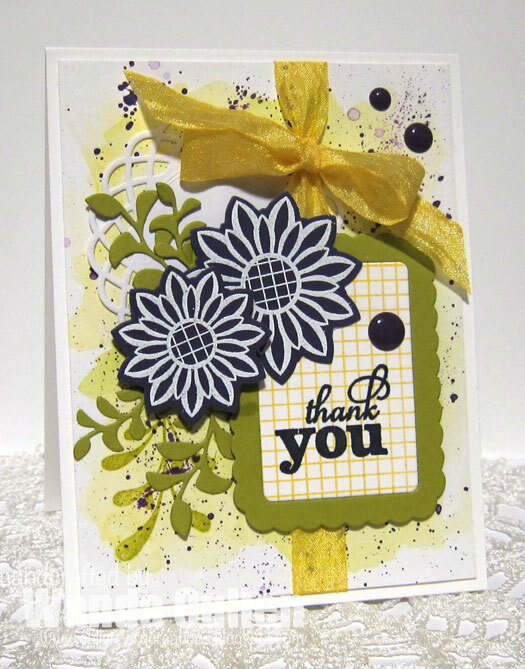 Big congratulations to our guest star stamper - LeeAnn Barrett of Greyt Paper Crafts! Be sure and stop by her blog HERE to check out her gorgeous card! 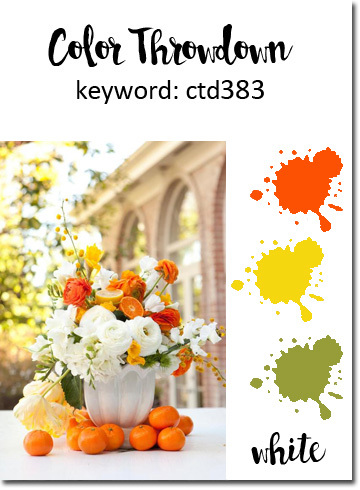 STAMPS: Garden Bunch, Fancy Word Coordinates (Reverse Confetti). INK: Daffodil Delight, Crushed Curry, Pretty in Pink, Melon Mambo, Memento Tuxedo Black. PAPER: Daffodil Delight (SU), Hello Sunshine by Doodlebug Design Inc., White (PTI). ACCESSORIES: Double Panel Hearts CC, Garden Bunches CC, Gift Card Holder Tag CC (banners), Leafy CC, Tag Me CC - all by Reverse Confetti; Melon Mambo ribbon by SU; Stitched Fishtail Flags STAX Die-Namics by MFT. It's Monday and that means the best part of the day is a new Mojo Monday Challenge! There's some new Verve in da house (if you haven't seen Julee's last release, you REALLY must check it out HERE)! 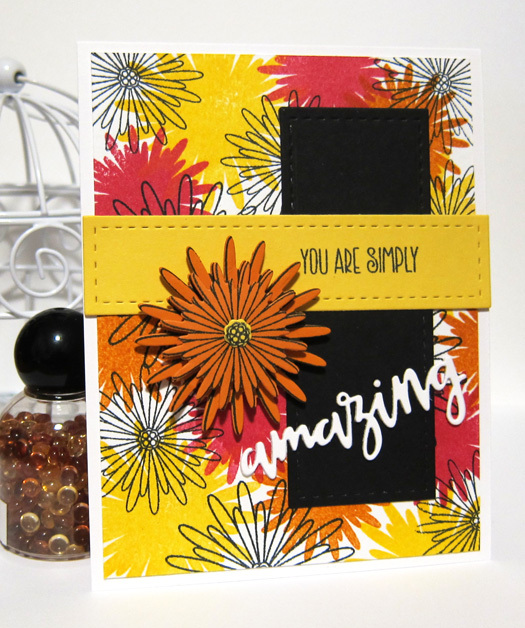 I wanted to create my own "designer paper" using the 2 different sizes of the solid and outline daisy images from the Simply Amazing stamp set! Who needs to buy patterned paper when you can make your own?! 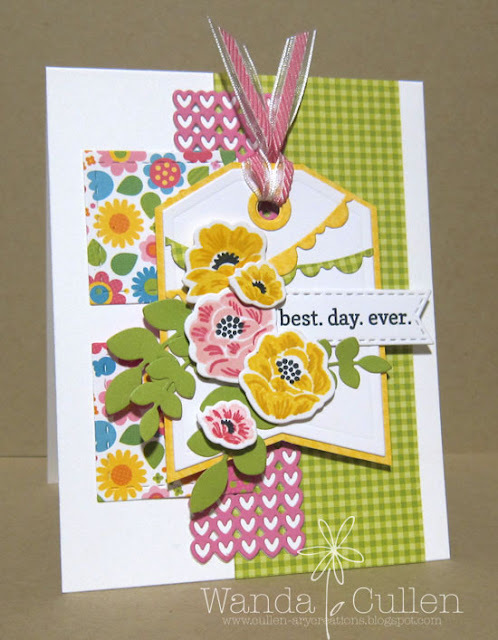 I also LOVE the new Amazing Adjective word die set and the coordinating Simply Daisies dies! I cut two of the script sentiment die from heavy weight white CS and glued them together to give it more dimension. The stitched panel dies are by Lil' Inker Designs. INK: Melon Mambo, Pumpkin Pie, Daffodil Delight by SU; Memento Tuxedo Black. Happy hump day everyone! Broni is the Color Throwdown Challenge hostess this week and has a warm and happy color palette that I just love!! Two new stamp sets by Papertrey Ink were calling my name to get inky: Peonies on Parade and Scripted. 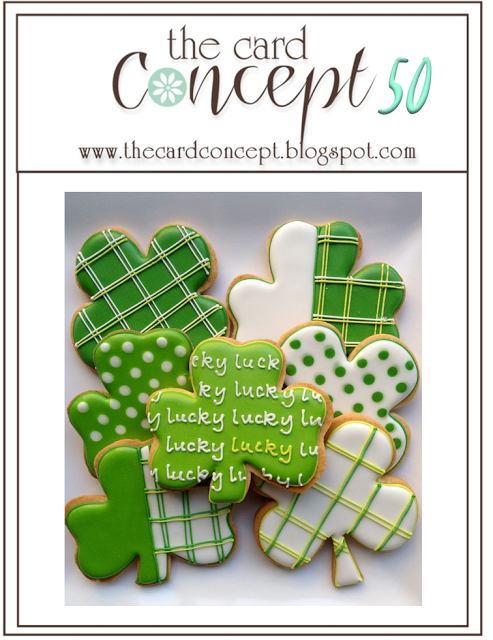 Love that both sets also have coordinating dies! 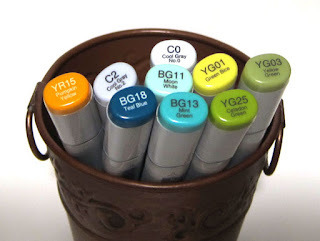 Next time, I will use watercolor paper instead of heavy weight cardstock when using an Aquapainter and distress inks. I didn't accomplish the color variation that I wanted. :-( The striped background is a large background stamp by MFT that I stamped 3 times using Memento Tuxedo Black ink and my trusty MISTI. Remember those dew drops that were all the rage many years ago? I decided to dig into my archives and adhered them with SU's fine tip glue pen. STAMPS: Peonies on Parade (PTI), Scripted (PTI), Diagonal Stripes BG (MFT). INK: Squeezed Lemonade, Mustard Seed, Crushed Olive, Peeled Paint, Spiced Marmalade, and Carved Pumpkin distress inks by Tim Holtz; Memento Tuxedo Black. It's a new month so that means a new guest designer! We're thrilled to have Leslie Miller joining us! 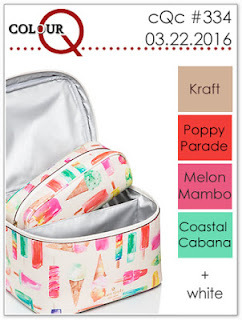 She has an amazing sample for us that you don't want to miss! Big congratulations to our guest star stamper - Bernadette Bliss! Be sure and stop by her blog HERE to check out her gorgeous card! PAPER: Ranger watercolor CS, White (PTI), Elegant Eggplant (SU) and Simply Chartreuse (PTI). INK: Daffodil Delight, Kiwi Kiss, Versamark, Squeezed Lemonade and Twisted Citron distress inks by Tim Holtz. ACCESSORIES: Sprightly Sprigs, Rounded Scallop Frame, Pointed Flowers - dies by Verve; Enamel dots by Recollections; Seam binding; Martha Stewart tag. While it was still only in the upper 40's today, I hear the weather is taking a warmer turn toward spring next week, so I'm pulling out some bright patterned papers to get into the spirit! 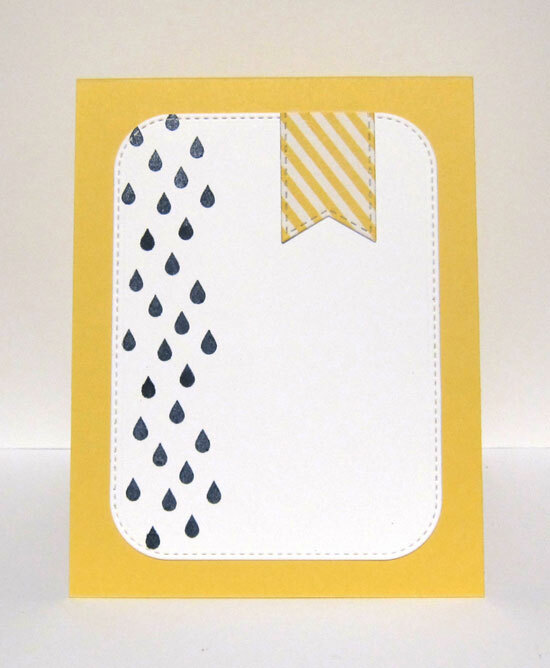 I kept my card very clean and simple for the current Freshly Made Sketches Challenge. 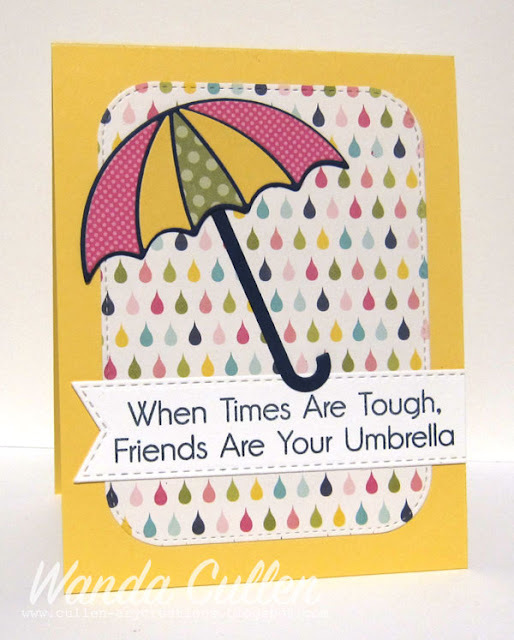 Patterned papers are all from Hello Sunshine by Doodlebug Design Inc. 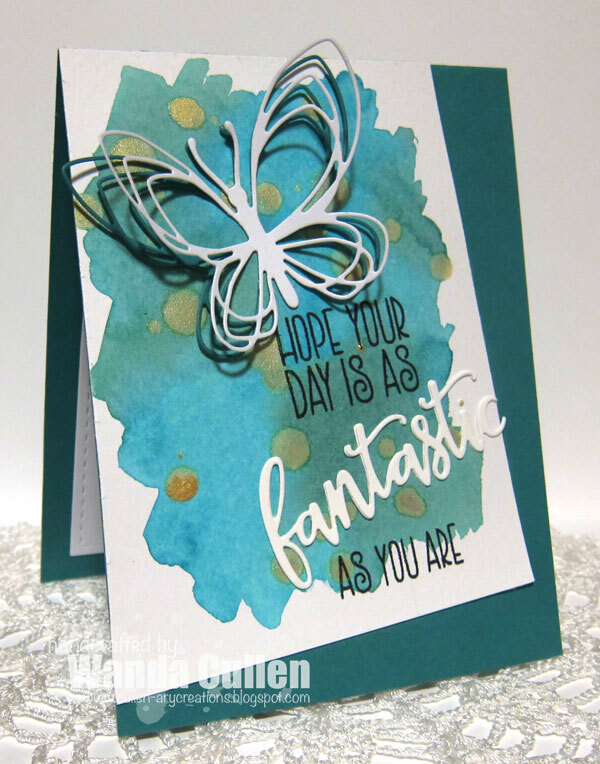 The sentiment is from Concord and 9th's Love You, Mean It stamp set and the gorgeous butterfly is from the Floral and Flutter Dies - also by Concord and 9th! I cut the die twice - once from vellum and once from white CS. The yellow border is a stitched die by Lil' Inker Designs. I'm playing along with the SCS Ways to Use It challenge to celebrate National Pet Sitters Week by including a pet on our card. The layout uses the current Retrosketches Challenge. For years, when our 3 children were young, we had a pet miniature goat! There are countless stories of the times Smoky got himself into trouble! He was a salt and pepper color - gray/white and black - and extremely smart! So, he is the inspiration for my card today. 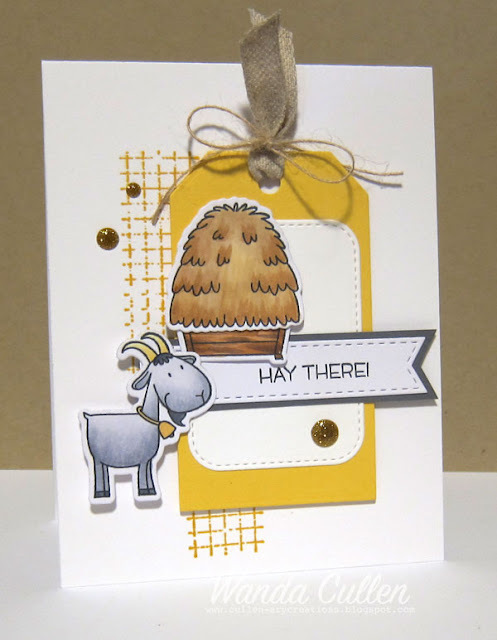 STAMPS: The Whole Herd (MFT); Timeless Textures (SU). INK: Crushed Curry, Memento Tuxedo Black. ACCESSORIES: Stitched Fishtail Flags, Stitched Rounded Rectangles, The Whole Herd and Traditional Tags STAX Die-Namics by MFT; Burlap ribbon and jute twine; Gold glitter enamel dots; Copics. I'm going with a CAS style for The Card Concept Challenge. With green being my favorite color, I'm always happy to see March arrive! :-) I used Twisted Citron and Mowed Lawn distress inks to do a watercolor background. I die cut two of the Boddington Tree Border (gorgeous border by Poppystamps) to add more dimension. 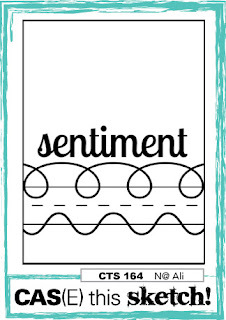 I stamped the sentiment twice using a MISTI to get perfect positioning for the repeated stamping. I thought a tiny black and white border design (paper by Recollections) would add more visual interest - prompted by a wee bit of smudging at the edge of the watercolor paper - lol! Don't you love how mistakes can often end up being a blessing in disguise?! 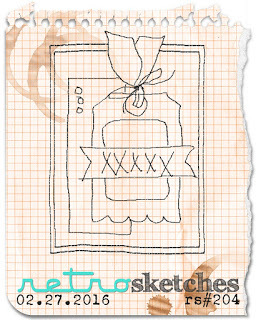 STAMPS: Painted Greetings by Altenew.